M-14 rifle training in the desert, Ft. Bliss, TX. 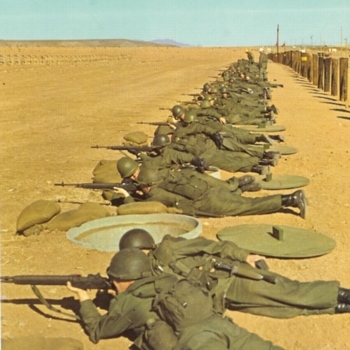 The green wooden lids prevented snakes, sand and tumbleweeds from getting into the foxholes when they weren’t in use. In this photo, we were learning to fire from the prone position.